"Are you not my godmother, Marozia, who held me at the font when I was baptized? "Yes," said the apparition, "I am indeed." "How then, do I meet you here, when I know that you died last year? What has happened to you on the other side of the grave?" The dead woman answered: "Until today I have been detained in unquenchable fire because of the sins of impurity I committed in my youth. I confessed them all, it is true, but though the guilt was remitted, I did not escape the temporal punishment which because of them, I have been undergoing in purgatory. 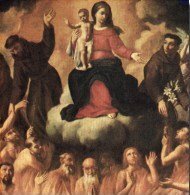 Today the Queen of Heaven, moved with compassion for the suffering souls, has obtained for me and many others, deliverance from our prison and admission to paradise in honour of the Feast of the Assumption. You see me only, but we are here in immense numbers, going from one to another of the churches dedicated to Mary, to thank Her for Her compassion." The pious woman stood amazed, not knowing what to think, but Marozia added: "In order that you may not doubt the truth of my words, I tell you that you will die next year on the Feast of the Assumption. If you are alive after that date, you may believe that all this is an illusion." And then she disappeared. The lady remained in church, no longer able to doubt that God had condescended to warn her in this way of her approaching death. From then on she renounced all wordly pleasures and lived a life of great austerity and retirement, constantly receving the sacraments of penance and the Holy Eucharist. The following year, two days before the Assumption, she fell ill. The next day her sickness was pronounced hopeless and on the Feast Day she piously expired.